See Rules for Check-in time and instructions. Weigh-in is set for 3 p.m. June 30th, 2018 at Lazarre Point in West Monroe. Snow cones, food and jump houses will be at the Lazarre for the kids. Raffle tickets will be available for a gun, rod & reel combination, a Pelican ice chest & other prizes at the weigh-in site. All proceeds will go to benefit the OPSO Deputies Benevolent Fund and Horses for Autism (HATS). All Federal, State, local parks and wildlife regulations shall apply at all times. Any public boat ramp south of Felsenthal, North of Columbia locks and any of the river tributaries in between may be used. First cast will be at 6am on June 30, 2018. Each person in the boat must be a paid contestant of this tournament and abide by all tournament rules and regulations. 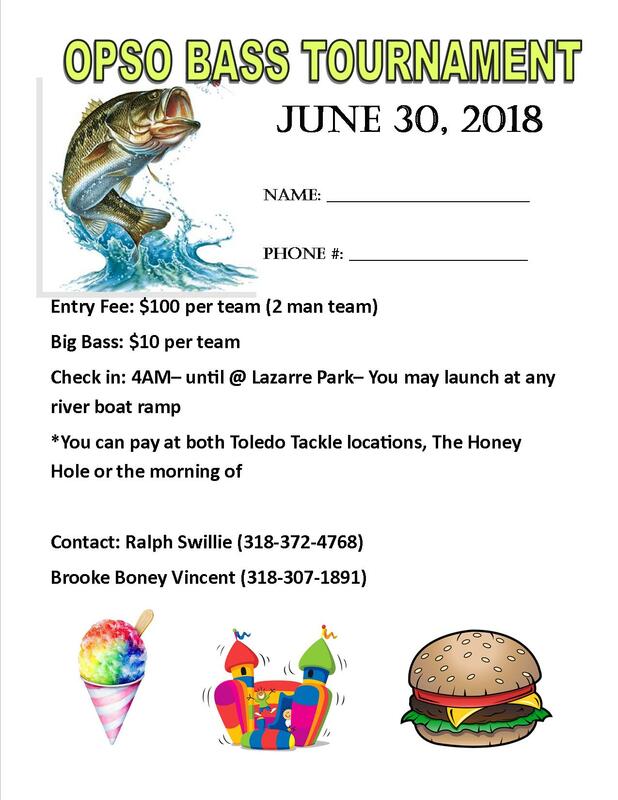 All bass caught by contestants fishing together will be disqualified if any of the contestants are found to be in violation if any tournament rules and regulations. Tournament officials have the right at their sole discretion, to refuse ANY entry. Participants under 18 years of age must be accompanied by a parent or adult with written parental permission at registration. CONTESTANTS: Double Tournament- Pick your own partner. Entry fee non- refundable. No exceptions. Trailering bass to the weigh-in site is allowed. You must be in line to weigh your fish by 3pm. Only five (5) bass allowed in possession in tournament boat at any one time. You must cull your catch after the fifth fish. SCORING: Scoring will be based on the weight of largemouth bass with a minimum length of 12 inches. Only (%) fish per boat will be counted. Fish presented for weighing that are less than 12 inches in length will be disqualified and one pound will be deducted from the day’s allowable weight as a penalty. If more than, five (5) fish are presented for weight then the largest fish will be disqualified. For each legal dead bass presented to tournament director for weigh in, the team shall be penalized .25 (or 4oz) per dead fish; this penalty will be deducted from the team’s tournament total. Any contestant(s) may be subject to a polygraph. CHECK IN TIME: 5pm Friday, June 29, 2018 at Lazarre Park or the morning of starting at 4AM. Sportsmanship. Courtesy, safety and conservation are expected from every participant. All bass weighed in will become the property of the tournament and will be released back into the tournament waters from which they were caught, live if possible. For conservation reasons, all bass brought to official weigh-in station must be a weigh-in bag with water. No contestant may win more than one place per official tournament. Minimal length of bass to be weighed is 12 inches.